US President George W Bush has said that President Musharraf is a courageous man and he appreciates his vision for democracy in Pakistan. In an interview at the White House on Wednesday afternoon, Bush said, "He (Musharraf) has got a tough assignment. On the one hand people are trying to kill him, while on the other hand he is taking the country further down the road to democracy." Bush said he keeps referring to his personal relationship with General Musharraf and his courage to side with the "world" in the war against terrorism. President Bush avoided a direct comment when asked about the Commonwealth demand that President Musharraf must decide about his dual office by 2007.
the road to reform. He understands the pressure being put on him." President Bush believed that Musharraf was committed to reforms in Pakistan and also to holding of free and fair elections. The US president said Musharraf is a courageous person. "Al-Qaeda tried to kill him more than one time," he said and went on to further appreciate Musharraf’s resolve against al-Qaeda, "No question the Musharraf government is committed" and is working to get al-Qaeda brought to justice. Responding to a question on the US offer to India for civilian nuclear cooperation and why a similar deal is not being offered to Pakistan, President Bush said that "It was just the beginning" of a long process, but he didn’t drop any hint to suggest that in future Pakistan may also get a similar offer. President Bush said that Kashmir would figure in his discussions with the Pakistani and Indian leadership, but as in the past he insisted that he would only try to encourage the leadership, staying away from playing a direct role. But twice, he underlined that the solution being discussed between Pakistan and India must be acceptable to all and by that he meant "Pakistan, India and the people of Kashmir". In what appeared to be his first comment on the Bajaur incident, President Bush said there had been coordination between the agencies of the two countries. But when pressed why the United States expressed no remorse on the loss of civilian lives, he said: "Of course, the United States mourns the loss of lives." Without elaborating on the circumstances that had led to the US strike at a remote village in Bajaur, Bush said: "We are partners in the war against terror, we are allies and we coordinate." When quizzed why the United States was trying to block the Iran-Pakistan-India gas pipeline project, Bush in his first-ever comment on the project said: "India, Pakistan and the US must send a united message to Iran that development of nuclear weapons is unacceptable … Iran must get a unified message from all of us." Commenting on the blasphemous cartoon controversy, President Bush emphasised the importance of a free press, but without mentioning the violent protest in Pakistan on this issue, he said: "I do not believe that people should use it as a pretext for violence … some are using the cartoons to achieve political ends." Agencies add: US President George W Bush said on Wednesday he would push the leaders of India and Pakistan to resolve the long-standing Kashmir issue during his maiden visit to the South Asian nations next week. "I will encourage them to address this important issue," Bush said ahead of his meetings with Indian Prime Minister Manmohan Singh and Pakistani President Pervez Musharraf. Noting that the two nuclear powers were engaged in talks on the border conflict that had sparked two of their three wars, Bush said they "now have an historic opportunity to work toward lasting peace. "For too long, Kashmir has been a source of violence and distrust between these two countries," Bush said in an address to the US-based Asia Society. "America supports a resolution in Kashmir that is acceptable to both sides." Bush said good relations with the United States could help both nations in their quest for peace. "Not long ago, there was so much distrust between India and Pakistan that when America had good relations with one, it made the other one nervous. "Pakistan now understands that it benefits when America has good relations with India. India understands that it benefits when America has good relations with Pakistan," Bush said. In India, Bush is also expected to discuss with Premier Singh implementation details of a controversial civilian nuclear deal they agreed upon last summer, acknowledging that "it will take time and it will take patience" to implement. Talks have been mired over Washington's demand that India put more reactors on a list of civilian nuclear facilities to be put under international scrutiny. "I'll continue to encourage India to produce a credible, transparent and defensible plan to separate its civilian and military nuclear programs," President Bush said. India reportedly wants to exclude its "fast breeder" reactors -- which could be used to produce plutonium for nuclear weapons -- from international safeguards. If the deal goes through, energy-starved India would be given access to civilian nuclear technology it has long been denied for conducting nuclear tests and refusing to sign on to the nuclear Non-Proliferation Treaty (NPT). Bush urged India to lift its caps on foreign investment, to make its investment and trading rules and regulations more transparent, and to continue to lower tariffs and open markets to American structural products, industrial goods and services. 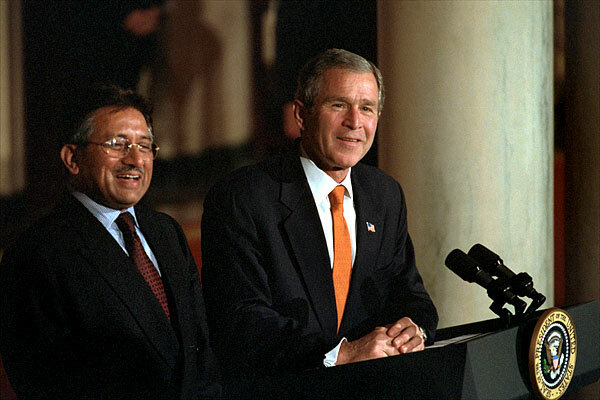 In Pakistan, Bush would discuss the "war on terror" with President Musharraf, who is under pressure to step up efforts in flushing out al-Qaeda kingpin Osama bin Laden and other leaders of the terror network from their suspected hideouts along the border with Afghanistan. He would also prod Musharraf to adopt democratic reforms and ensure that key elections scheduled next year were "open, free and fair." "This will be an important test of Pakistan's commitment to democratic reform," he said. The US leader acknowledged that his first visit to South Asia since he assumed office in 2001 came at "a sensitive time" amid protests in the region over the publication of controversial cartoons. Some of the protests were violent, targeting Western embassies and businesses. Bush said "this is a sensitive time in South Asia". "In Pakistan and other countries, images broadcast around the world have inflamed passions, and these passions have been cynically manipulated to incite violence. America believes that people have the right to express themselves in a free press. America also believes that others have the right to disagree with what's printed in the free press, and to respond by organising protests so long as they protest peacefully. And when protests turn violent, governments have an obligation to restore the rule of law, to protect lives and property, and ensure that diplomats who are serving their nations overseas are not harmed. We understand that striking the right balance is difficult, but we must not allow mobs to dictate the future of South Asia." "In this vital region, the stakes are high and the opportunities are unprecedented." Speaking at a roundtable interview with the press pool aboard Air Force One en route Andrews Air Force Base, Maryland, Bush said his coming visit to Pakistan and India "is going to be important". "It's going to be an important trip, one where we'll work on a variety of issues with both countries -- security, prosperity and trade; working with India, of course, on energy security. It will be an important trip," he said.